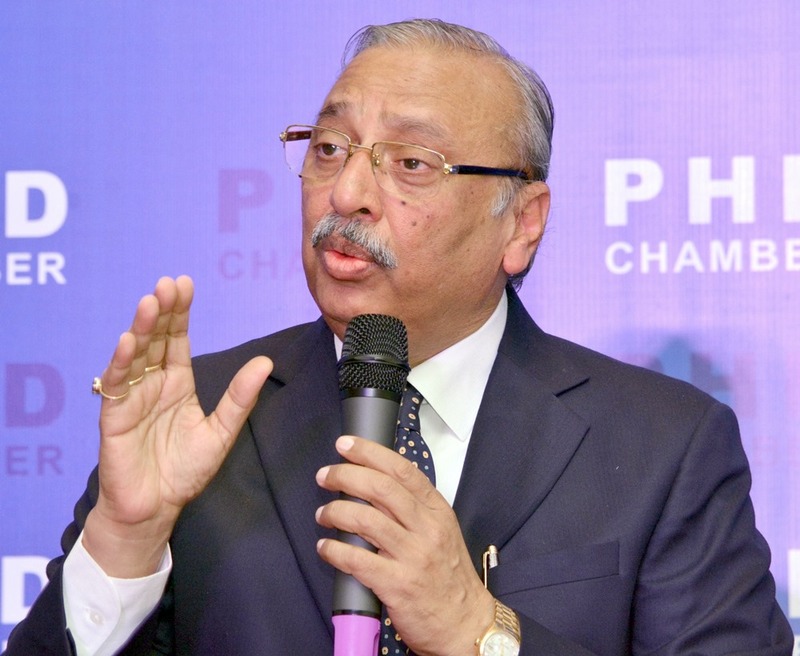 PHD Chamber of Commerce & Industry (PHDCCI) today asked the government to push the housing and construction sector by increasing the deduction of up to Rs 5 lakh from the current level of Rs 2 lakh for interest paid on a home loan on a self-occupied house while calculating income tax. Further loss in income tax to the exchequer would exceed by increased earnings in excise duties and service tax to be collected from boosted in demand in real estate sector, Dr Gupta said. Stimulus to real estate sector would provide a significant fillip to the economy and enhance India’s GDP by another two percentage points and so will be the level of enhanced revenue to the government and desired fiscal consolidation, said Dr Gupta who is also Chairman of the Kent RO systems. Dr Gupta also emphasized that the government expenditure in infrastructure needs to be increased to boost industrial demand. Releasing the PHDCCI’s Vision Document, its chief lauded the new government’s dynamic economic thrust has already led to an economic breakthrough during the past 18 months. “We are proud of our country is emerging as the fastest moving in the world economic system, he said, adding that economic reforms like Make in India, Digital India, Swachh Bharat, Jan Dhan, Pension schemes, Smart Cities and e-Biz platforms would go a long way to put India’s growth on the high road in the near future. Dr Gupta said the GDP growth is strong on the back of acceleration in industrial activity in the recent months (October IIP at 9.8%). “We look forward to strong industrial growth recovery with the sector registering double digit growth in the coming times, he said, adding that revival of demand scenario is also becoming visible as consumer goods grew at around 18% during 2015. He also noted that the exports are decelerating since the past 12 months but that is majorly due to slowdown in global demand conditions. “Improvement in India’s ranking on World Bank’s Doing Business Index to 130th from 142nd last year is inspiring and we look forward it below 50 in the next three years,” Dr Gupta said. The chief of 110-year old prestigious apex chamber, Dr Gupta appealed to all political parties to unite for smooth passage of the economic bills, particularly GST, in Parliament to help achieve inclusive growth. “We believe GST will be implemented soon to create a common market within India to reduce the transaction costs and cascading impact of complex tax system, he said, adding that with the implementation of GST, the growth trajectory will improve by 2 percentage points with a significant improvement in ease of doing business. Seeking a revisit of the new Companies Act 2013, he said it is not synchronous with the growth of the businesses as the compliance is extremely high. It is also not conducive to the growth of not just large enterprises but micro, small and medium enterprises, he added. Demanding a “level playing field”, Dr Gupta said the domestically produced goods cost more than the imported ones in some sectors, and that the “inverted duty structure” is a major deterrent for manufacturing in India. Appreciating the significant decline in inflation in the past 18 months, Dr Gupta said inflation is in controllable manner so that investments will help generate industrial demand. The Chamber suggested a major focus on agriculture sector reforms to diversify the crop pattern, enhanced productivity, better irrigation facilities and seed technology to mitigate the impact of food inflation in future. Calling for an entrepreneurship-led economic growth, he said this will act as a catalyst not to just boost innovation but also create employment. Asking the government to open more accredited vocational training institutes at different geographical locations, he said skill development of the youth was crucial to enhance the productivity in agriculture, manufacturing and service sectors and also to improve global competitiveness. Demanding repeal of existing labour laws, the Chamber said such laws have put unnecessary regulatory burden on businesses. Asking the government to frame a single comprehensive law instead, it demanded simplification of exit rules for Indian and foreign entities. Improvement in physical infrastructure with targeted outcomes such as state-of-the art transportation facilities, improved quality of railway services, expansion of ports and civil aviation would reduce the transaction costs significantly and help businesses to plan their production possibility frontiers, Dr Gupta said, adding that reforms in energy sector are needed to stem the increasing energy import dependence. Renewable and clean energy sources must be encouraged. The Chamber’s Vision Document envisages a Transformed India where the economy is in double digit growth trajectory, the manufacturing sector is globally competitive, the agriculture sector is sufficient to sustain the rising population and millions of jobs are created for socio-economic growth of the nation. The Transformed India will be the dream India which will provide housing for all, education for all, easy access to medical and health facilities as well as safe and better standards of living to the vast populace of the country. Transformed India would promise every citizen to his or her potential and contribute towards self, family and the country. In short, the New and Transformed India will have numerous success stories to tell, demonstrate and sell to the world, the Vision Document said.